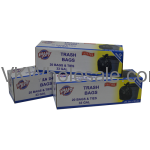 We carry different kinds of plastic trash bags for dollar stores. 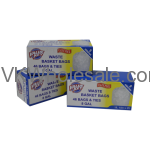 We also carry trash bags in value packs that can be sold at dollar stores. Use our trash bags to keep it clean. These trash bags are perfect for cleaning up at home, backyard or even during picnic at park or on the beach. Stock up trash bags for dollar store and make profit. 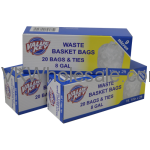 Minimum quantity for "26 GAL Extra Strength Tall Kitchen Trash Bags - 10 Bags" is 24. 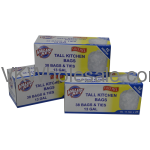 Minimum quantity for "33 GAL Extra Strength Tall Kitchen Trash Bags - 7 Bags" is 24. Minimum quantity for "39 GAL Extra Strength Tall Kitchen Trash Bags - 5 Bags" is 24. 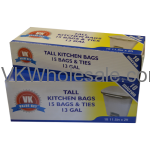 Minimum quantity for "Value Key 13 Gallon Tall Kitchen Bags, 38 Count" is 12. 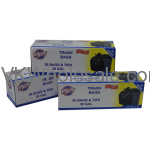 Minimum quantity for "Value Key 30 Gallon Twist Tie Trash Bags, 26 Count" is 12. 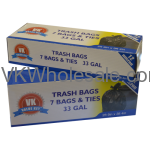 Minimum quantity for "Value Key 33 Gallon Twist Tie Trash Bags, 20 Count" is 12. 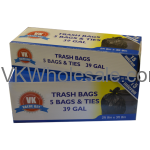 Minimum quantity for "Value Key 39 Gallon Twist Tie Trash Bags, 18 Count" is 12. Minimum quantity for "Value Key 8 GAL Waste Basket Trash Bags, 20 Count" is 24. Minimum quantity for "Value Key 8 GAL Waste Basket Trash Bags, 46 Count" is 12.